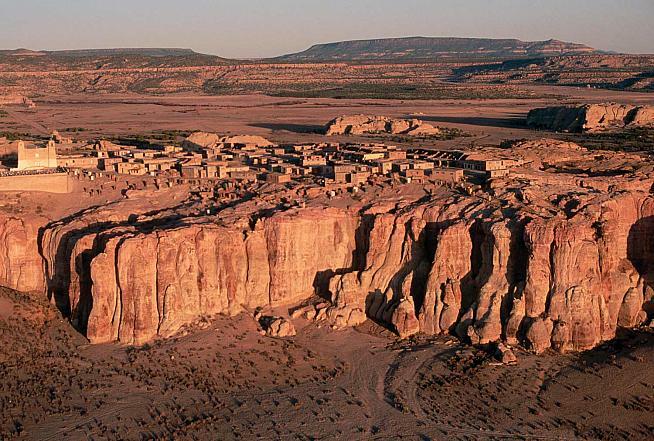 In the American Southwest you won't find a more breathtaking backdrop than Acoma Pueblo's "Sky City". 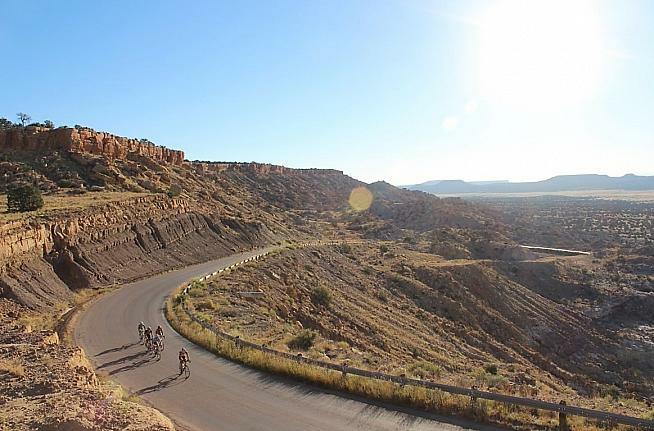 Built atop a sheer-walled, sandstone mesa in a valley studded with sacred, towering monoliths it is the oldest continuously inhabited community in North America and known for its rich culture, pottery and the bucket list worthy Tour De Acoma. 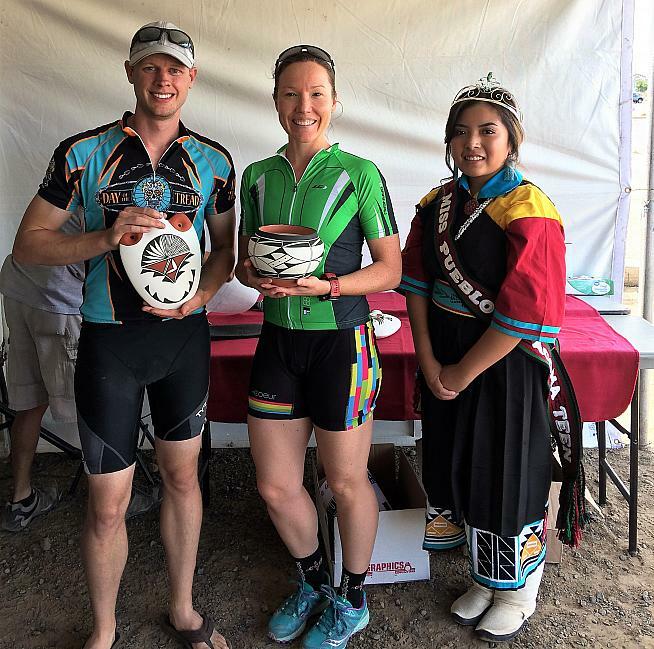 Offering ride lengths of 100, 50 and 25 miles with male, female and tandem categories the Tour De Acoma offers every rider a chance to win prized Acoma pottery. 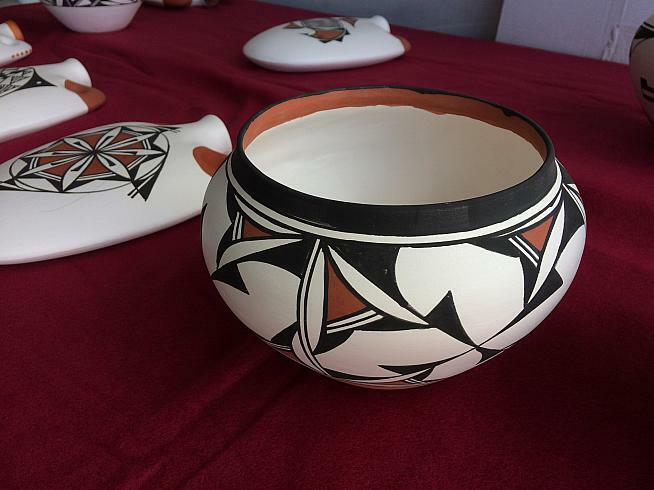 Plus, with all proceeds going to the Haak'u Museum Foundation the event helps preserve New Mexico pueblo history and art. That's a good thing. - Don't stand out like a tourist in a Hawaiian shirt, pronounce Acoma as ACK-uh-muh. - Photos are forbidden on pueblo land so leave your phone and just enjoy the views. 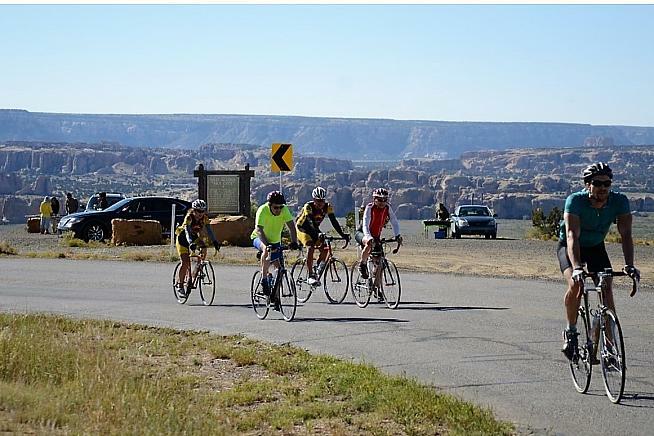 - Competitive riders gravitate towards the 100- or 50-mile events with the 25-miler reserved for recreational riders, no sandbagging racers allowed. - You never know who will show up. 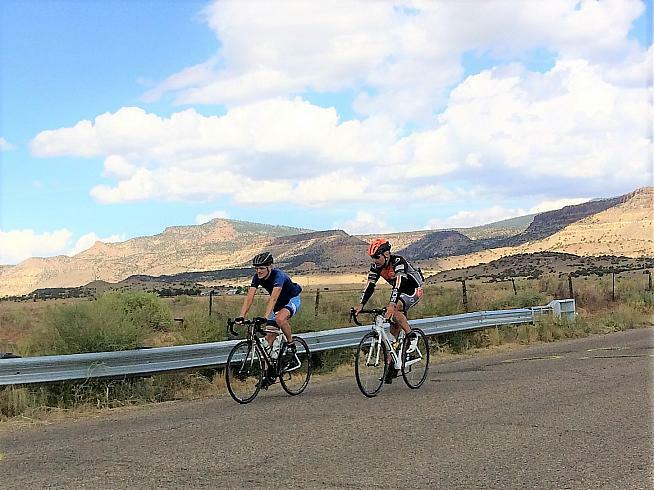 Southwest racing legends John Frey and Jim Warsaw are in the 100-mile event this year. Decades ago I raced against both (well, at least I started with them) when they were at their peak and set the US National 40K Tandem Time Trail record. - 50 and 100-mile routes start off fast on a rolling downhill, warm up beforehand. - At 10-miles Kadzima (Enchanted Mesa) towers in front with the morning sun illuminating its sheer walls while shadows cling to the backside. It's one of the most beautiful monoliths in the region. - Down the road a few miles Sky City's adobe buildings cling to the mesa tabletop above. Don't stare too long or you'll put a crook in your neck and miss the turn to Kuumi, the only significant climb. - On paper, Kuumi doesn't seem too tough with 1.5 miles at 6%, but beware some sections pitch to 12%. Stop at the top for an impressive view of Sky City. Today, the 100-mile group doesn't stop, they never do. Just like decades ago, Frey and Warsaw are off the front and I'm chasing. - On the long downhill to McCartys check out 11,000 foot Kaweshtima (Mt. Taylor) to the north. Soon it will be snowcapped. 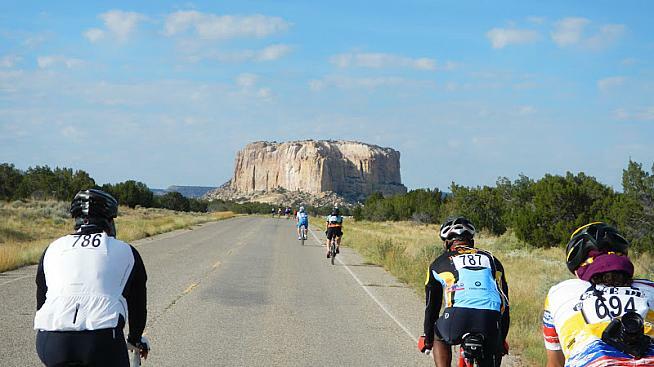 At I40 the 50-mile route turns east towards the finish while the 100-mile route continues into El Mapais National Monument. - The El Mapais out and back section starts with a gentle uphill, but into a not-so-gentle headwind. Don't work too hard, it's 20-miles till the turn-around. Eventually you'll be rewarded with a downhill tailwind return to McCarty, offering a chance to catch riders up the road, which is what we do - even with Warsaw's textbook team blocking. - Rolling back through McCartys note the cool lava flow on either side of the road. At only 3,000 years old it is one of the youngest volcanic features in the lower 48. I, on the other hand, am one of the oldest features in the group - and feeling it. With only a few flat-ish miles remaining focus on turning those pedals over. You are almost there! - Stay vigilant at the finish with potholes, cattle guards and a wee bit of gravel about. In the 100-mile event Too-Young-To-Be-A-Legend Fortunato Ferrara easily wins the solo male category with his team sweeping the podium. Legend John Frey with stoker Blue Soroos wins the tandem category, while Jim Warsaw and I finish swapping tall tales about racing "back in the day" - when we had hair. 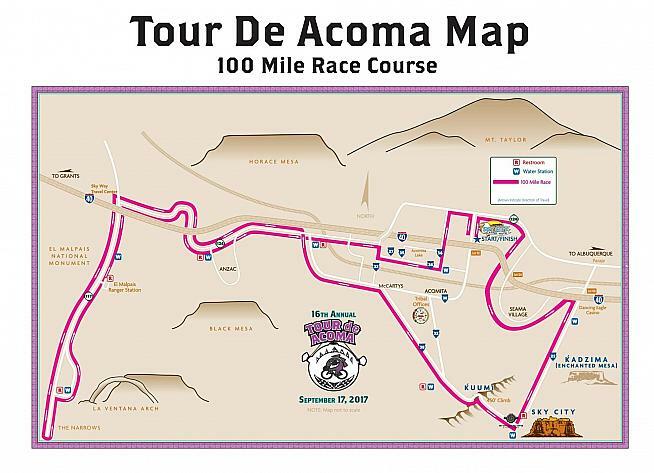 The Tour de Acoma, now in its 16th year, is a Southwestern treasure. Held just west of Albuquerque in September it offers a unique chance to ride on tribal lands with monumental mesas dotting the landscape. Within a day's drive of Dallas, Los Angeles, Salt Lake City, Phoenix and Denver it makes for a perfect fall bucket ride road trip weekend, including some must have Acoma fry bread.